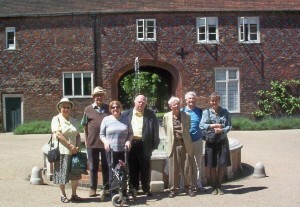 On a beautiful day in June, Tuesday 10th, 9 members met in Fulham to enjoy a guided visit to All Saints Church and Fulham Palace. Fulham is probably one of those places in London, that, not being in the city or west end, very few people visit – unless of course they’re football or boat race fans! Rather a pity as, down by the church on the river, we could have been in a pleasant country village. 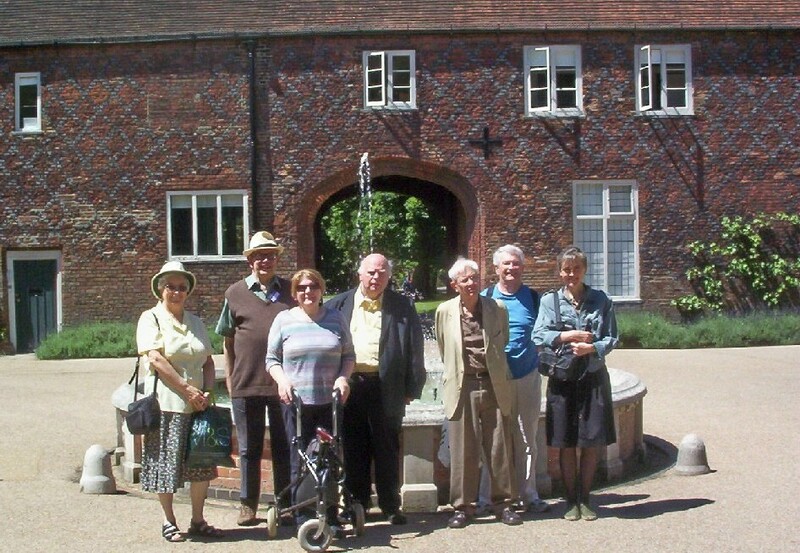 We were met by our guide Vernon Burgess, one of the voluntary guides attached to Fulham Palace, a member of All Saints Church, and an extremely knowledgable local historian, all of which meant that we were in for an very interesting and informative day. Fulham is an ancient borough whose name whose name could mean ‘place of fowls’, ‘place of mud’ (referring to the constant flooding in past ages) or ‘place in bend of the river belonging to Fulla’. In the 18th century it became known for gambling, and a ‘fulham’ was a name given to loaded dice! In more recent times Fulham became the home of Frederick Simms, an early motor enthusiast who brought the Daimler concession to Britain, was instrumental in the abolition of the 4 mile an hour speed limit and a founder of the RAC, and notably pioneered the first armoured car before the First World War. A survivor of the Second World War is a pillbox, now a listed monument, on Fulham tube station! 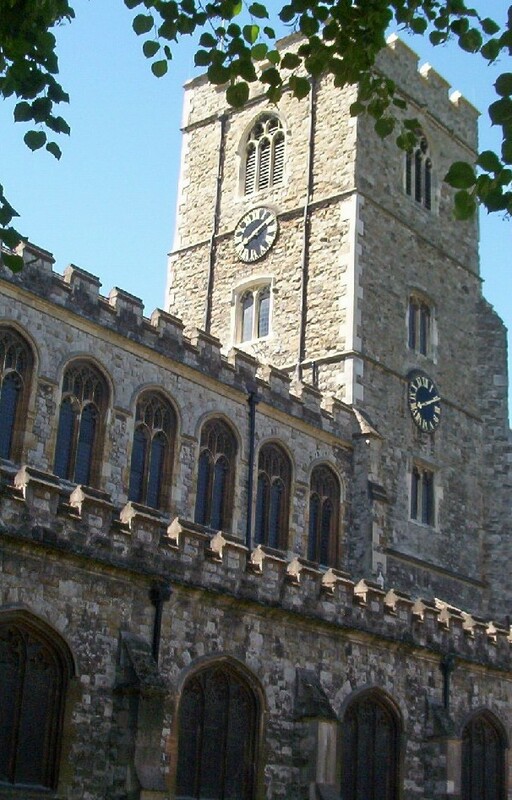 Fulham’s most notable residents however were the Bishops of London, whose home was Fulham Palace from about 700 to 1973 A.D. and who were closely associated with the parish church. All Saints, originally dating from the 13th century, was rebuilt in the first half of the 15th century. 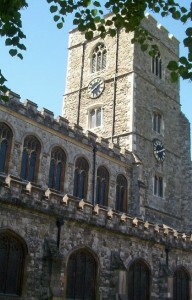 This church in turn was replaced in 1880, but the fine Perpendicular tower from the 15th century remains. (It is this tower, along with its twin across the river at Putney, which can be seen at the start of the annual boat race.) The tower has a fine peal of 11 bells. The church contains many furnishings and monuments from the older building, including an Early English font, Jacobean altar rails, and some 15th century heraldic glass. The most noteworthy monuments are to Sir William Butts, Chief Physician to Henry VIII who appears in Shakespeare’s ‘Henry VIII’, and to Thomas Carlos, whose coat of arms on the memorial depicts and oak tree and 3 crowns granted to his father who hid with Charles II in the oak tree after the Battle of Worcester. The churchyard has many fine tombs, most notably those of several Bishops of London, and that of Granville Sharp, prominent in the anti-slavery movement and a founder of the British and Foreign Bible Society. It was because of this association with a predominantly non-conformist organisation that the vicar of the time would not allow his funeral sermon to be preached in the church! An amusing headstone to Isabella and Joseph Murr has a typically flowery 18th century verse about the wife, but simply says of her husband ‘He’s gone too’!. A curious feature of many of the graves was a concrete hump, placed there, Vernon informed us, to foil bodysnatchers. A row of fine 19th century almshouses stand just outside the churchyard. Fulham Palace was once a vast moated manor of 36 acres. The moat was only filled in in the early 20th century, but a section has now been excavated. The oldest part, on approaching from the entrance, dates from the Tudor period and looks quite cosy round a small courtyard. The oldest room here is the Great Hall. Later additions are compose of 3 different periods of Georgian architecture, including one in ‘Strawberry Hill Gothick’, although some of the more obvious features were later altered. We were able to see dining and drawing rooms, decorated by various bishops and their wives, as well as the library and rooms now turned into a museum and restaurant. There have been several chapels; the latest was built in 1867 by William Butterfield and decorated in his usual colourful style; after bomb damage in the Second World War, the Butterfield style was unfortunately out of favour, and murals now obliterate his decorative brickwork. The gardens surrounding the palace are a great asset, and provide a setting for relaxation, open air events, and the study of botany: it seemed to be a required qualification that the bishop should be a tree collector, as there are many exotic and rare trees to be seen. Even when felled, one Cedar of Lebanon, now known as the Bishops’ Tree, is adorned with sculptures carved with a chainsaw by Andrew Frost of several former bishops. All in all we spent an extremely enjoyable day, with thanks again to our guide Vernon, and to Graham for organising. 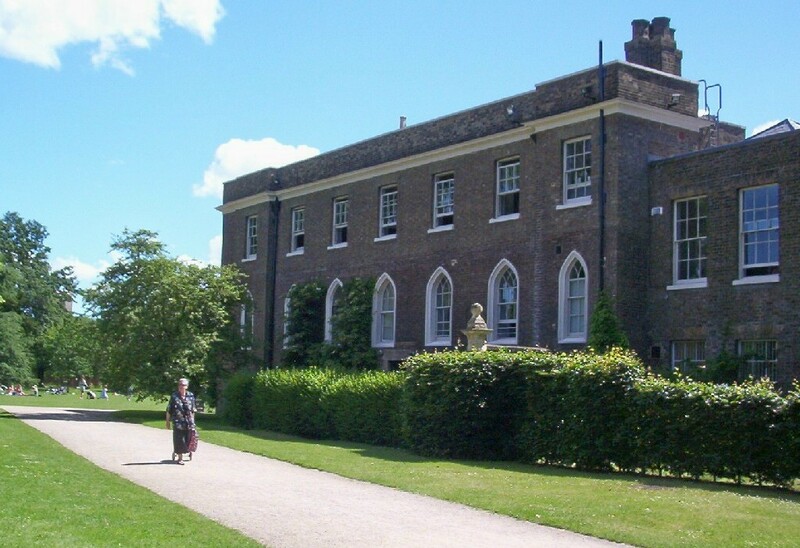 Fulham Palace and grounds, once the private manor of the Bishops of London, when Bishops were ‘Princes of the Church’ and lived accordingly, is now an asset to be enjoyed, both by the residents of Fulham and by visitors wishing to escape from the bustle of London.